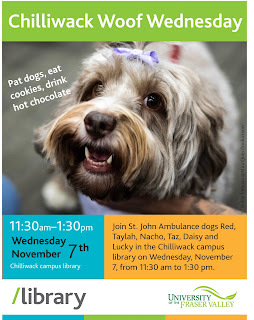 Chilliwack Library Woof Wednesday, November 7, 11:30 a.m. to 1:30 p.m.
Join St. John Ambulance dogs Red, Taylah, Nacho, Taz, Daisy and Lucky in the Chilliwack campus library on Wednesday, November 7, from 11:30 am to 1:30 pm. Cookies and hot chocolate included in this free event. Films on Demand is now working but they are still trying to recover from their systems failure. Though they hoped that all would be working at full capacity by Monday, October 15, 2018, certain issues still remain. Here is their advisory. which highlights a set of full text historical periodicals from 1684 to 1912. These are primarily American, although they include some Canadian and UK periodicals. The periodicals cover all subject areas including business, agriculture, American civil war, literary, medical, church, college and student, hobbies and sports, slavery and abolition, science, temperance, women’s periodicals, education, etc. Here is more detailed information on Series 1-5 in the collection. Monday, October 8th, is Thanksgiving, and the Chilliwack and Abbotsford libraries will be closed. The hours for the rest of the weekend are as usual and are listed below. Have a great long weekend, and remember that our ebooks and research databases will be available all weekend long!